We see no shortage of stories where heroes and villains insist on using swords despite the existence of guns. It’s used to show how awesome they are compared to everyone else. And to paraphrase Obi-Wan, swords in all their varieties are more elegant weapons. 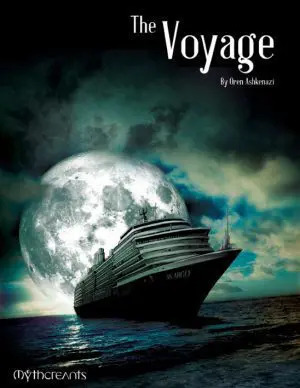 However, if they’re used carelessly by the storyteller, the audience can lose their suspension of disbelief. In real life, there’s only one outcome to a swordsman charging at a henchman with an assault rifle. It’s still possible to have swords play a role in a modern or futuristic settings. You just need to shape audience expectations, and you can do this a few different ways, each with its benefits and potential pitfalls. The cutting edge of foam dart technology. For a straightforward approach, reduce the destructive power of guns in your setting. If firearms are less reliable or there are good countermeasures against them, it becomes more feasible to fight hand to hand. We see this in Pacific Rim, where the Kaiju are armored well enough against the Jaeger’s weaponry that it mostly comes down to brawls. Because the scale is already outside our norm and the movie primes us to see melee as more effective, it seems reasonable when the ultimate Jaeger weapon turns out to be a sword. This approach requires you to be mindful. The fact of the matter is that a cannon can deliver a lot more energy than a Jaeger’s fist. Audiences are generally willing to ignore this discrepancy when it’s used to put brawling and sword fighting on par with or slightly better than guns. However, if you become overzealous with nerfing firearms, it will start to feel forced. 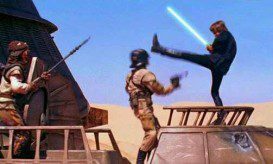 Dune’s personal shields reduce warfare to knife dances. Another option is to introduce technology that discriminates against the higher velocity of projectiles. Dune has personal shields that deflect attacks with high kinetic energy. Forever War has fields placed over a battlefield that negate kinetic and electromagnetic energy. In both cases the setting is going a step past nerfing guns to take them out of the fight completely. This allows the story to progress as if guns aren’t a factor at all or as weapons that can only come into play if someone first disables the field generator. The downside to this exotic technology is that it requires more set up and exposition for the audience to understand it. Anti-Kinetics change the rules of the game enough that your audience won’t be able to intuit what is and isn’t affected without you giving some background first. You can create swords that are much more than a sharpened metal blade. In Warhammer 40,000 power swords are surrounded by an energy field that acts like a plasma cutter. Star Wars has lightsabers, blades of pure plasma. Both these super swords can slice through the strongest materials as if they were industrial strength cutting tools. Armor and barriers that are resistant to sustained punishment from gunfire are melted with ease. Introducing super swords doesn’t solve the initial problem on its own, however. The super sword may be very effective, but unless you can survive long enough to close the distance, an opponent with a gun still wins. 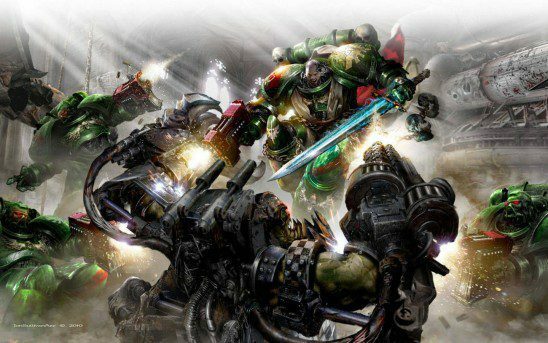 Armoring combatants against all but the strongest firearms and explosives is the method used in Warhammer 40,000. 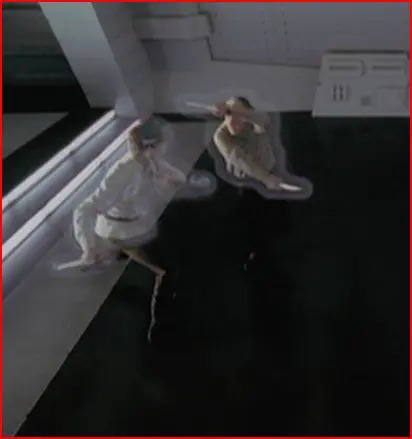 In Star Wars, Jedi are given super human perception and reaction time to deflect blaster fire, essentially using the sword as a shield. Okay Vicious, you got to Spike before he could shoot you. Now what are you going to do about that gun pressed to your sternum? If nothing else fits, you can simply have characters skilled enough to avoid gunfire. Marvel’s Daredevil uses his speed and agility to stay ahead of where his opponent thinks he’ll be. 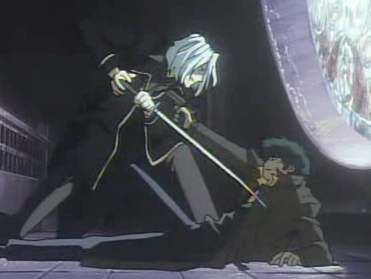 In Cowboy Bebop, Vicious manages to avoid gunfire and fight Spike with a sword. Simply being too fast or agile to shoot is always an option in fiction. When the characters fighting this way have special powers, it’s easy to get away with. Even without powered characters in your story, you might get a pass from some audience members who are used to the convention. But others may find it too unrealistic or gimmicky, so make sure to know who you’re writing for. It’s definitely possible to make melee weapons feel relevant in a world with guns, lasers, tanks, and spaceships. You just need to create the conditions for it, and be aware of the implications of the technology. Be mindful of how your audience will perceive the technology you introduce and what elements they are willing to suspend disbelief for. Then when your hero brings a sword to a gunfight, everyone will see that they are making the smart choice. You forgot stealth. It’s how ninjas and xenomorphs and sometimes Predators beat firearms with only melee attacks. Clearly, not always a viable option, but probably the most realistic when it is set up right. Also; restricted acesses to guns. In my setting, a lot of action happens in space, in stations or small colonies, where both the fragility of the place, and the difficulty of using guns in low gravity makes them less desirable, and banned, for the most part. One wrong shot, and everyone dies. I use something similar, but they build their space stuff to be super rugged. A stray gunshot is likely to fry a computer or damage a mechanical part but not rupture a hull. Is it, however, very likely that all engagements occur within knife range when you’re on board a ship. 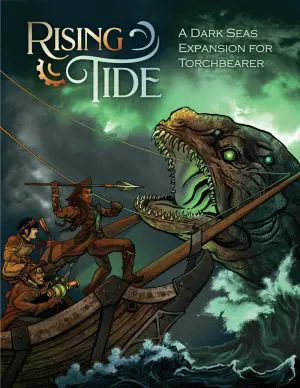 They make use of pikemen and bulkhead seals to funnel boarders. I would also recommend lowering the technology of the gun. It’s only been a few decades since the basis of the assault rifle was invented. Barely over 100 years since semi-auto pistols were even a thing. If we go back to musket era then the individual with a gun is half relying on luck to hit, which is why massed volleys were a thing. This doesn’t even devolve into ‘everyone carries swords’ (in my particular case anyway), because, well, swords were never that common. More like ‘everyone carries aluminum baseball bats and hunting knives’. Though of course this just creates demand for metalworkers to make cheap, sharp pointy things. A well-age wooden bat can do a lot of damage, too. In a post-apocalyptic world, everything ‘low tech’ is back in high demand, because most of those objects can be made without some kind of industry. A person who can do some metalwork can make knifes, spear heads, arrow heads, and other sharp pieces of metal. Bullets will become a rare item soon, because you need a lot of chemicals (for the gun powder) and precision machines (casing and finishing up) to make them. Muskets don’t use bullets with a casing, though, so those might be an option (if you have a chemist at hand for the powder). Even poorly made muskets are accurate up to fifty meters. I dont know about you but i have a hard time putting a hole in a man sized target with a deer rifle at that range. Formaitions and vollys wherf a thing for one reason control of the field. My bad ladt article i read was from last month. FYI your comment wasn’t deleted. The pure amount of bullets whizzing over the field made it likely for them to hit something. Same with arrows, but a well-made long bow or hunting bow is a lot more reliable. And once the enemy is fifty meters in front of you, you have other problems than the accuracy of the musket – you won’t get more than one shot before the enemy has reached you and will start the melee fight. I know I’m a little (a lot) late to the party, but the superhero web serial Worm partially gets rid of guns in a very interesting way. Due to other various story elements, most super villains are (according to a certain character) caught up in “the game”. Everyone goes out in costume and fights, and as long as the villains don’t seriously screw up or go way too far, the status quo remains essentially the same. Whether the character in question is right or wrong, it translates as very few supers actually using guns at all – it flips the switch, so to speak, between “the game” and everything becoming so much more serious. Not to mention that with supers, there’s always the possibility that a gun just might do damage – or do damage to an innocent bystander instead, which brings up the ‘game’ once more. While swords and swordplay is the bread-and-butter of the fantasy genre, it seems that swords and other melee weapons, can mainly be used in Sci-Fi as a “gauge” for the hardness/softness of said Sci-Fi setting. The prominently swords are featured in a Sci-Fi setting, the more that setting is leaning towards being a “soft” Sci-Fi world/story. In the Duniverse most fighting is melee with swords and knifes, and the same universe features clairvoyance, precognition, and semi-telepathic powers. In Star Wars Jedi and Sith slug it out with light-sabers, and are sustained by a mysterious “force” granting them supernatural powers. In WH40.000 there is an immense lot of heroic melee, and the same universe features demons, Gods and magic. Semi-soft Sci-Fi, featured in many Space Opera´s, use swords and melee´s more as an occasional phenomenon. Swords are used, but only as a “fringe” phenomenon under special circumstances. Most fighting are done with slugthrowers and/or beamweapons. Examples include Star Trek, Babylon 5 and Mass Effect. Semi-hard or outright hard Sci-Fi settings, rarely have a place for swords, because while swords and sword fighting are definitely cool, they are not really realistic in a high-tech setting. I am an old martial arts practitioner and fencer myself, and I absolutely love swords and swordplay, but the sad truth is that missile weapons grow progressively more effective with rising tech level. For Fantasy and soft Sci-Fi swords are great, but for a harder Sci-Fi setting, one has to cook up some very good explanations, which in themselves will have significant implications for society more general, to include swords and lots of melee ! Does anybody remember a science doco from about 2010 where they mentioned a process for manufacturing wafers of carbonado (black diamonds)? The stuff is virtually indistructible and very light, and you could easily create a suit of carbonado armour with little more than a vacuum chamber and a robotic arm to coat the molds with carbon. I imagine it would be far cheaper than making an assault rifle. I’ve tried to find information on the stuff for my book but it’s as though it never existed. Interesting! However, even if that could create armor that could block bullets, I suspect any such armor would be so strong as to block swords too. Therefore, it wouldn’t really be a way to make swords in particular useful. I would add environment as something that can tilt a combat from firearms to melee. If all of your combat is taking place in tight, twisting corridors – imagine the dark alien hive from Aliens – then combat is likely to start within stabbing distance or close to it. Particularly combined with advanced sword technology, a vibro-sword might feel just as appropriate of an armament as a machine gun. In a fictional setting with industrial era but pre-WWI technology, especially before repeating rifles and semi-auto pistols of various types became commonplace, swords and knives were hardly obsolete. As late as the early 1900s, many different nations and powers were still manufacturing perfectly usable military swords, not for show, but for actual self-defence. Both sabres (mainly for cavalry, but shorter ones for infantry and police too) and straight swords (either with cut-and-thrust blades or the revival of the flat but thrusting-centered blades idea). Before guns become strong enough, accurate enough and with a high rate of fire – “all in one package” – having a bladed sidearm (even a larger one) is actually a very good idea, regardless of whether you’re an officer, a soldier, a local policeman. Tellingly, even in our era, when bladed weapons are gone almost completely, even from militaries, police still often carry at least a baton or something similar, in case they were unable to defend themselves or others up close with a firearm or other ranged means. In this context, I’m somewhat reminded of Nix’s well-known fantasy novel Sabriel, where the nation of Ancelstierre is basically on a late 19th century technology level, and they use both firearms and bladed weapons. In the latter case, they have an extra incentive to do so, given the nature of the setting: The Old Kingdom to the north of the border cancels out the functionality of modern, industrial era technology, so the soldiers guarding the border outright have to fall back on swords whenever their guns simply refuse to work.